Oh, that wascally wabbit! 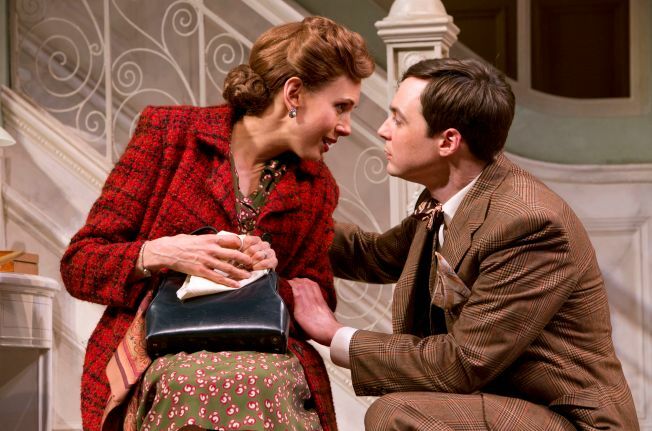 Jessica Hecht and Jim Parsons in the Roundabout Theatre Company’s “Harvey” at Studio 54. When Elwood P. Dowd, the good-natured protagonist of “Harvey,” invites you to dinner, or anywhere else, he means it. Personified famously by Jimmy Stewart in a 1950 film, Dowd is played by Jim Parsons ("The Big Bang Theory") in a Roundabout Theatre Co. production at Studio 54 that gives us a fresh take on the earnest, affable bachelor whose best pal is a 6-foot-tall invisible rabbit. Mild-mannered and what you would call eccentric, Dowd hands a business card to everyone he meets, cabbies included, a trait that at first befuddles, then fast charms most strangers. When a saleswoman calls from a magazine club, hawking "Ladies Home Journal," Dowd not only orders two subscriptions—one for him, one for the hare—he invites the caller to a party sister Veta (Jessica Hecht) is giving at that very moment: “We would consider it an honor if you would come and join us." Sweet, sort of. Still, what outsiders find endearing, the members of Dowd's inner circle, in particular Veta, find suspect, embarrassed as they are by their loved one’s indiscriminate attachments and his buddy-bunny relationship with Harvey, a “pooka,” or spirit, whom they can’t (usually) see. As you watch “Harvey,” allow yourself to be awed by the show’s pedigree: it was first directed on Broadway in 1944 by Antoinette Perry, whose legacy is honored each year with the “Tonys.” Stewart assumed the role from Frank Fay in that first run, and then originated the role in the 1950 film adaptation and a 1970 stage production, the latter opposite Helen Hayes. As noted, this latest “Harvey” stars another fella with a reputation for being a nice guy, Parsons, 39, a two-time Emmy winner as the uber-geek Sheldon Cooper on “The Big Bang Theory.” Rest assured, Parsons’ Elwood P. Dowd is every bit as agreeable and charming as his Dr. Sheldon Cooper is cantankerous and caustic. It's Parsons' first Broadway turn since his debut last year in Larry Kramer's "The Normal Heart." Hecht, a Tony-nominee for “A View from the Bridge” and a recurring character on AMC’s “Breaking Bad,” seems here to be unleashing years of pent-up comic energy. “Doctor,” she says, during her failed attempt to have her brother committed, “I’m going to tell you something that I’ve never told anyone in the world before. Every ... once in a while ... I see that great big white rabbit ... myself.” The words begin in polite restraint and end in the growl of a lioness. If anyone here is pulling a magical performance out of a hat, it’s Hecht. Sitting through the brisk performance with a room full of New Yorkers, you can’t help but wonder how “Harvey” plays outside of don't-make-eye-contact-Gotham. A man who talks to an invisible rabbit would spur most of us to give him a wide berth. Yet, in his world (for what it’s worth, “Harvey” is set in Denver) strangers warm to Elwood Dowd, because he shows genuine empathy. There’s nothing false about the way he listens to people, and ultimately, of course, we’re left to question just who needs more mental health care. “Harvey,” at Studio 54, 254 W. 54th St., through Aug. 5. Tickets ($37-$127) through Roundabout Ticket Services at 212-719-1300 or online at roundabouttheatre.org. Performances at 8 p.m. Tuesday through Saturday, with a 2 p.m. matinee on Wednesday, Saturday and Sunday.